Are Hauman and citizens ignored? Alderman Diana Hauman took it on herself to gather citizen input on the budget. She asked 6 people to look at the budget and look for savings. 2 had to drop off, but 4 with extensive business experience spent months looking at everything. Evidently they aren’t allowed to present their findings because all 4 spoke during public comment at the last meeting instead of doing a presentation. Tari? Tari? The salary increases far outpace the cost of living and increases in the private sector. Probably the easiest part to understand is the chart in the lower right corner. City employees are only contributing 25% of the cost when the private sector is contributing 40%. The maximum out-of-pocket is much higher in the private sector too. This is why I call their insurance: Gold-Plated. If the federal government ever allows the “Cadillac Tax” to go into effect (See Obamacare), the City will be paying a 40% penalty. Since employees are the biggest expense . . .
the City could at least bring compensation in line with the private sector. It doesn’t say a word about evaluating benefits. They might be able to not fill 10 low-level jobs – total savings, including pensions and benefits, is only $500,000. I don’t know what jobs these would be since very few employees have total compensation below $50,000. Not evaluating compensation and benefits means the City isn’t serious about controlling costs. The piggy bank (you) is ripe for more theft by taxes. Posted in BloNo, Bloomington, Local, pensions, Progressives, Renner, Taxes.Tagged Alderman Diana Hauman, citizens budget committee, compensation, employee healthcare costs. I noticed that the salary increases for the Solid Waste truck driver does not include benefits. 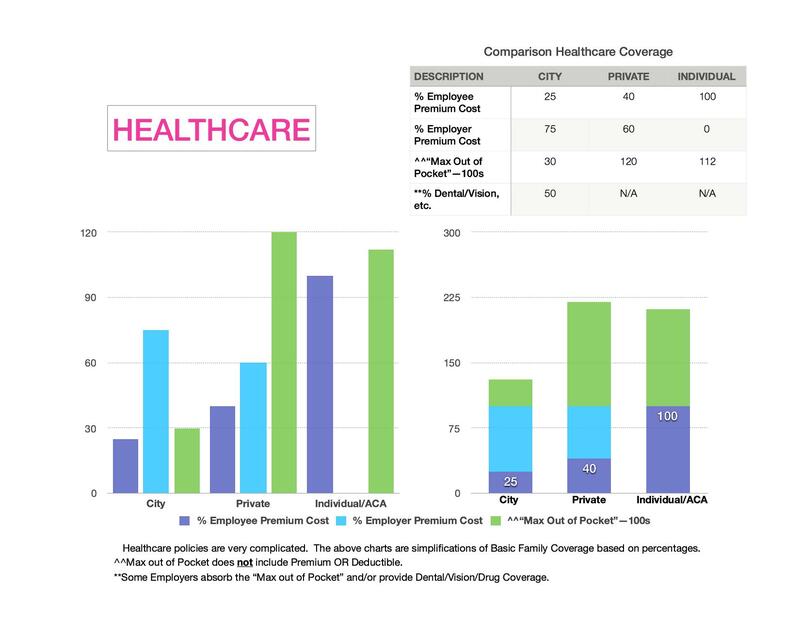 Also, the taxpayer is not only paying more out of pocket for their healthcare but is also paying 75% of the employee’s premium plus the difference between City employee out of pocket and actual cost of a medical procedure. No wonder the union doesn’t want solid waste outsourced to a private company. I applaud councilwoman Hauman for the effort. Pensions will crush this community and state if we don’t switch to a defined contribution plan instead of defined benefits. Private sector went this way with 401k. Time for the state and municipalities to follow. Only alternative is to raise taxes which will lead to more leaving the state and less tax revenue. A conundrum unless the underlying structural deficits are addressed. That salary for the Solid Waste truck driver begins at the median income level which is just over $50K for a family of 4. If I’m not mistaken, 50% of Bloomington’s population would fall below that income level. 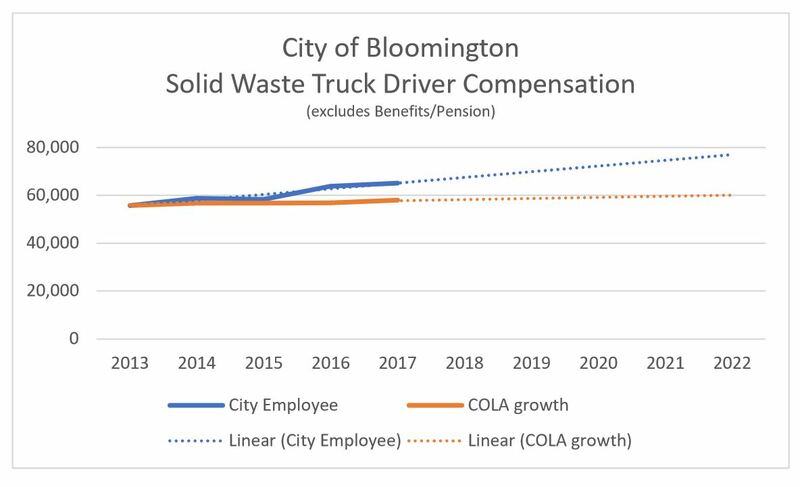 As the City employee’s salary and benefits increase, the private sector’s spendable income will decrease because they will end up paying more for the public sector benefits and while making relatively less income. This is just not sustainable nor is it equitable. Where are those Social Justice people? Ha! Ha! The social justice people are sleeping with the government employees, unions, and Mike Matejka founder of Not In Our Town.,. Mike Matejka ALSO has a “cush” job. In which he PRETENDS to be some kind of labor historian, and “friend” of the regular people. He is NEITHER! This kind of Government spending can only lead to TWO things. HIGHER TAXES or CUTS!